It is very rare to keep both south and north Indian cuisines in menu card especially when the recipes are drawn from the royal kitches. Jamavar restaurant have got her name from the big wall hangings on the beautifully curved walls, which are actually Jamavar Shawls. They have managed well with not only the north and south Indian but a whole slew of regional cuisines. Their Biryani and Kebabs is very special. But as they charge very high it’s been suggested to those who are having heavy pockets and small appetites. 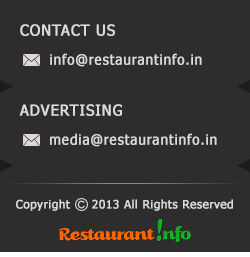 This restaurant serves specialties from Rajasthan, Lucknow, Punjab, Goa and Kerala. So from the range of name we can easily assume what will be the range of dishes they are offering. The location of this restaurant in a luxury hotel in the very heart of the business district is wonderful as it’s situated just beside a beautiful pool. Bay of Bengal is a venture of Bijoli Grill, a very famous caterers in Kolkata. They have opened this Air conditioned outlet serving genuine Bengali fare in this city. Their Kobiraji, Cutlet, Fish Orly etc. are reasonable priced but all of them are awesome in taste. You should try Bhetki Paturi, Illish Sorshe, Chital Macher Muithya which are different varieties of Fish items. And it’s above K.C.Das, so after a lipsmacking lunch and dinner you should give a visit in K C Das to try some bengali sweet dishes like Rabri, Rasogolla, Mishti Doi. This is specially a techie hangout as this restaurant is in the heart of ITPB. In the lunch time their buffet is very popular. Their snack items are also very tasty like Kathi Rolls, Tikki, Lassi etc. which are served between 4 to 7 pm. Their dinner buffet is less expensive but that time restaurant is less crowded. The main reason behind this success is making all food less oily as those techie guys are very much health conscious. Bombay post has tried to create the Bombay of 60’s or 70’s. On the walls you will found charcoal portrait of Bollywood legends. Street foods like Kebabs, Frankies and also some anglo-Indian specialities of sea-foods are available. For authentic Bengali Cuisine you must visit this place. 6, Bullygunge Place is very famous in Kolkata. They serves best Illish [Hilsa] Paturi and Daab Chingri, Chingri [Prawn] Maacher Malaikaari. And for veg-lovers they have Posto Bengun. And don’t forget to have their Luchi and Kosha Mangsho [Meat] or Luchi and Cholar Daal. From the list of dessert items you should try Nolen Gurer Ice cream. Location : 4, 1st Main, Chakravarthy Lyt. Palace Road Cross. For the Goa-lovers this restaurant is a must visit. Their awesomely decorated ambiance has special attraction to the visitors. This restaurant is awesome at the night. Their foods are also very decent but their Bar runs better. And also for the people who have never been in Goa, Opus can be a trial version to them. The tastefully decorated restaurant serves few unusual cuisines like Rajasthani and Kashmiri. Their Dinner and Lunch buffet is a very good option here. Their Daal Bati Churma is very popular among Rajasthani Items. And in Kashmiri Cuisine they serves very good meatballs which is commonly known as Rista and Gushtaba. Rajasthani Halwa is good attraction here. Rajasthani Tea is a must have which contains Saffrons and almonds.